As the country's youngest ever Taoiseach, it's not surprising that Leo Varadkar would look to his predecessors, but emulating Enda and Bertie all at once was most unexpected. The Fine Gael faithful gathered in Wexford over the weekend where they were given their orders ahead of elections in May. With Brexit overshadowing everything that moves in politics at the moment, Mr Varadkar attempted to remind them that all politics is local. "Brexit will define and consume the United Kingdom for the next generation. It doesn't have to define us. "We are in control of our destiny, and have the power to build a better future for all of our citizens," he said. But for a man who prides himself on being part of the 'new Ireland', he very much drew his inspiration from the past. 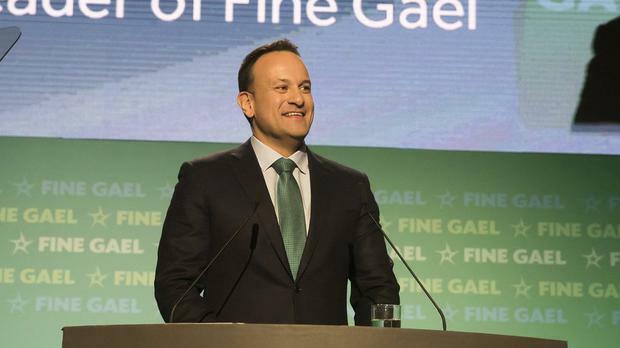 He told delegates that with a growing economy "so much is possible", adding "and Fine Gael is the only party tried and tested and trusted to keep our economy strong". The rallying call had echoes of Bertie Ahern's message to Fianna Fáil in the run-up to the 2007 election, which resulted in a historic third term in office for the Dubliner. One Fine Gael strategist privately admitted that Ahern's tactic of convincing voters his party was the "only one" to keep the boom going worked. Of course, history tells a different story but this is a new ball game. A more obvious nod to the Ahern-era of soundbites and slogans were the posters at the conference proclaiming 'Fine Gael - Taking Ireland Forward Together'. Describing the tagline as a case of reinventing the wheel might even be too generous. Back in 2007, one of Fianna Fáil's main slogans was 'Fianna Fáil - Together let's take the next steps forward'. The fact is Ahern was a good campaigner who knew how to win elections, so perhaps it's not surprising that Varadkar would try emulating his style. But what about the substance? Well, for that the Taoiseach looked closer to home. During the 2011 election campaign, Enda Kenny was widely mocked for never shutting up about his 'Five-Point Plan'. He rarely appeared on radio or television without referring to it - but on election day voters bought into it. His plan was about creating jobs, fairer budgets, creating a new health system, downsizing government and reforming the political system. Some of it was achieved during his term in office and many of the promises fell by the wayside after Fine Gael entered coalition with the Labour Party. But Varadkar, who was never too fond of Kenny's leadership style, now appears to have reincarnated his plan. The new version is called 'Five Steps' to build a better future. His subheads are: a strong economy, a society in which nobody feels left out, world-class infrastructure, Ireland at the centre of the world, and protecting our environment. Unlike at previous gatherings, Fine Gael ministers were very keen to play down talk of an early election over the weekend. Naturally there were digs at the 'hurlers on the ditch' in Fianna Fáil and the "toxic" Sinn Féin - but it seems Varadkar is now more comfortable to allow Confidence and Supply drag on. But as our 'fight to death' story on pensions shows today, a general election this year remains a very real possibility.